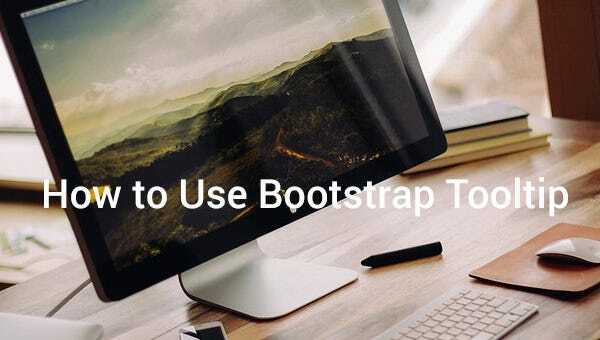 In this article, we will be checking on how to use Bootstrap Tooltip. But before that we will be looking into few things about tooltip first. For the performance point of view, we need to initialize tooltip before it can be used. We can initialize tooltip using a code, but we need to make sure that we are using `toggle` data attribute of an elements. Once tooltip is initialized, it will generate markup to show a tooltip. We will see what kind of markup it will generate based on data attributes we have given. Tooltip plugin has got a good amount of options, so we can customize that as per need. We can use these options while initializing tooltip object or we can utilize data attribute for each option. We can use option name as a data attribute. e.g. data-animation, data-selector, data-title, etc. All the options for this plugin can be found here. Just like options we have all possible methods and events assigned to a tooltip, which we will be looking into next section. Events are handlers which we can utilize to perform a custom action on the specific event of Tooltip. You might have a question on how to use this event, not to worry have a look at below code on how to utilize these events. Hope you find this tips to use Bootstrap Tool helpful. Share your views in comments below.